Last updated 11/29/2011 by David Giblin. Publication: Gen. Sp. Orchid. Pl. 288. 1835. Notes: Taxonomy follows FNA. Hybrids between Platanthera huronensis and P. stricta may be the source of the incorrect report of Platanthera × correllii Schrenk (P. hyperborea × stricta) from WA, made by KZ on the strength of a personal communication by P. M. Brown, and not supported by specimens. FNA does not map Platanthera sparsiflora north of the Siskiyou Mountains, suggesting all WA reports (e.g., H&C from Skamania Co., and WNHP from Skamania, Yakima, Chelan & Whatcom Cos.) were misidentifications of the notoriously variable Platanthera stricta. Further work is needed support reports of Platanthera sparsiflora from Washington. FNA26: "The plants here treated as Platanthera stricta have in common more or less saccate spurs, orbiculate viscidia, and leaves that abruptly diverge from the stem, often at angles approaching 90Âº (this feature is sometimes obscured in sheltered, deeply shaded habitats). The plants described as P. gracilis Lindley are florally typical of the slender-spurred extreme of P. stricta; they differ only in peculiarly reduced, slenderly oblong but nonetheless abruptly wide-spreading leaves. The plants figured by C. A. Luer (1975) as P. hyperborea var. gracilis (Lindley) Luer are not referable to P. stricta but rather are apparently hybrids of P. stricta and P. dilatata. 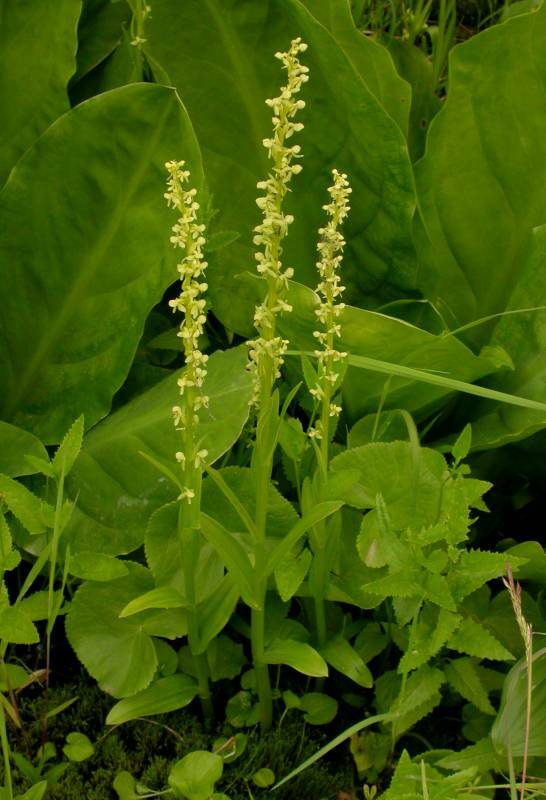 Critical study of the description of Habenaria borealis var. viridiflora Chamisso and an evident isotype show this plant to be referable to P. stricta, although the name has been applied to P. huronensis in the Northwest and to P. convallariifolia in Japan. See also the discussion under 9. P. convallariifolia." » Sheviak, C. J. 2000d. Refinements in our understanding of some green platantheras. No. Am. Native Orchid Journ. 6: 88-92. Habenaria borealis Cham. var. viridiflora Cham.